Grandma’s Last Will and Testament names Ray to inherit the trailer park. 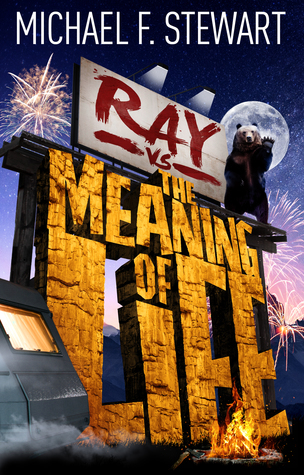 It’s a million-dollar estate with one hitch: to prove he’s not as aimless as he seems, Ray must discover the meaning of life by the end of the month. (She left the answer in an envelope.) If he fails, the camp goes to his estranged family. How does anyone find the meaning of life while running a park full of misfit miners, would-be truck racers, and one demanding little girl? There’s a bear too. A grizzly. Maybe that’ll help? Michael F. Stewart embraces all forms of storytelling. In 2009, he created Bully For You for Scholastic Canada, a fully functioning social media platform with an embedded interactive story. He’s written graphic novels for Rubicon Publishing’s Boldprint series, illustrated early readers and novellas for Pearson (coming in 2019! ), non fiction texts on Corruption and Children’s Rights; he even tried to convince the world that we needed a location based storytelling app with augmented reality (NARR8R)-we still do! 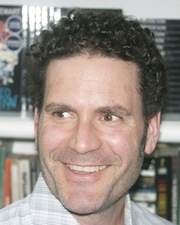 He’s written adult horror, sci-fi, urban fantasy, and adventure. He’s even written books you’ll never find. But nothing is ever wasted. His most recent book, Counting Wolves, a contemporary YA, was named to Kirkus Reviews “Best Books of 2017” list. The Boy Who Swallows Flies (2018) won Killer Nashville’s Claymore Award, and the Assured Destruction Series won The Creation of Stories: Best YA Award at the Toronto International Book Fair. In 2016, Michael was selected to join the CFC/Entertainment One TV Adaptation Lab. Herder of four daughters, Michael lives to write in Ottawa where he was the Ottawa Public Library’s Writer in Residence and runs free writing workshops. To learn more about Michael and his next projects visit his website at www.michaelfstewart.com or connect via Twitter @MichaelFStewart.